As the new owner of Sullivan’s Pub in County Cork, Ireland, Maura Donovan gets an earful of all the village gossip. But uncovering the truth about some local rumors may close her down for good in this mystery in the County Cork series. Bostonian Maura is beginning to feel settled in her new Irish home, just in time for summer tourist season to bring fresh business to her pub. But the first traveler to arrive is thirsty for more than just a pint of Guinness. Althea Melville is hot on the trail of a long-lost Van Dyck painting. 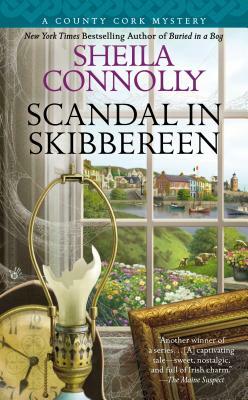 Sheila Connolly is the New York Times bestselling, Anthony and Agatha award-nominated author of the Orchard Mysteries, the Museum Mysteries, and the County Cork Mysteries. She has taught art history, structured and marketed municipal bonds for major cities, worked as a staff member on two statewide political campaigns, and served as a fundraiser for several nonprofit organizations. She also managed her own consulting company, providing genealogical research services. In addition to genealogy, Sheila loves restoring old houses, visiting cemeteries, and traveling. Now a full-time writer, she thinks writing mysteries is a lot more fun than any of her previous occupations. She is married and has one daughter and three cats.